In the common law tradition, testamentary capacity is the legal term of art used to describe a person's legal and mental ability to make or alter a valid will. This concept has also been called sound mind and memory or disposing mind and memory. Adults are presumed to have the ability to make a will. Litigation about testamentary capacity typically revolves around charges that the testator, by virtue of senility, dementia, insanity, or other unsoundness of mind, lacked the mental capacity to make a will. In essence, the doctrine requires those who would challenge a validly executed will to demonstrate that the testator did not know the consequence of his or her conduct when he or she executed the will. Certain people, such as minors, are usually deemed to be conclusively incapable of making a will by the common law; however, minors who serve in the military are conceded the right to make a will by statute in many jurisdictions. In South Africa, however, one acquires testamentary capacity at the age of 16 years. The extent and value of their property. The legal test implies that a typical claimant in a will contest is a disgruntled heir who believes he or she should have received a larger share than they did under the will. Once the challenging party meets the burden of proof that the testator did not possess the capacity, the burden subsequently shifts to the party propounding the will to show by clear and convincing evidence that the testator did have the requisite capacity. The best known or most authoritative text on the common law test for capacity is the judgment of Martin Nourse QC (who was then sitting as a deputy judge of the High Court and later became a Lord Justice of Appeal)in Re Beaney, deceased  When someone gives away a substantial proportion of their assets, the general rule is that they must have the same degree of capacity as is required for a will. "The degree or extent of understanding required in respect of any instrument is relative to the particular transaction which it is to effect. In the case of a will the degree required is always high. In the case of a contract, a deed made for consideration or a gift inter vivos, whether by deed or otherwise, the degree required varies with the circumstances of the transaction. Thus, at one extreme, if the subject-matter and value of a gift are trivial in relation to the donor's other assets a low degree of understanding will suffice. But, at the other, if its effect is to dispose of the donor's only asset of value and thus for practical purposes to pre-empt the devolution of his estate under his will or on his intestacy, then the degree of understanding required is as high as that required for a will, and the donor must understand the claims of all potential donees and the extent of the property to be disposed of." Lawyers for people whose testamentary capacity might be called into question often arrange for a will execution to be video taped. On video, they ask the testator about his property and about his family, and go over the contents of the testator's will. Even when a testator are found to have lacked testamentary capacity due to senility, loss of memory due to the aging process, infirmity or insanity, courts will sometimes rule that the testator had a "temporary period of lucidity" or a "lucid moment" at the time of the execution of the testamentary instrument. Such finding will validate a will that would otherwise be denied probate. A way to forestall a will contest would be to have a self-proving will, in which an affidavit of the witnesses to the will specifically swear or affirm that the will was prepared under the supervision of an attorney. The presumption of capacity Where a will is rational, professionally drawn, seemingly regular in form and is made by a person whose capacity is not in doubt, there is a presumption that the will is valid. This presumption can be rebutted by a challenger to the will showing that there is a real doubt about capacity. At this point the burden of proving capacity moves to the propounder of the will to then show that there was testamentary capacity at the time the will was executed. Testamentary capacity Testamentary capacity is the mental capacity required to make a valid will. The current test comes from the decision in Banks v Goodfellow (1870). This case concerned the validity of the will of John Banks. In modern terms he would most likely be described as a paranoid schizophrenic. He suffered from delusions that he was being persecuted by devils (they were sometimes visible to him) and also by a deceased local grocer. His will was challenged on the basis that he was insane and therefore unable to make a will. The will was found to be valid after trial by jury, before Brett J, at Cumberland Spring Assizes in 1869. On appeal, this judgment was confirmed unanimously by a panel of four appeal judges in Queen's Bench. The will was found to be valid, not influenced by his delusions, and deemed rational, being in favour of his only close relative (who also lived with him). 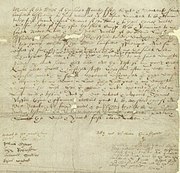 In a strong and eloquent judgment, Cockburn CJ set out the following test of the capacity to make a valid will, which still applied in many Anglophone jurisdictions today: “It is essential to the exercise of such a power that a testator shall understand the nature of the act and its effects; shall understand the extent of the property of which he is disposing; shall be able to comprehend and appreciate the claims to which he ought to give effect; and, with a view to the latter object, that no disorder of the mind shall poison his affections, pervert his sense of right, or prevent the exercise of his natural faculties—that no insane delusion shall influence his will in disposing of his property and bring about a disposal of it which, if the mind had been sound, would not have been made.”  This remains the test today, notwithstanding the Mental Capacity Act 2005. It is now considered as being composed of four distinct elements and that understanding is required of  the nature of the act of making a will and its effect  the extent of the property that is to be disposed of  the claims of family or friendship to which he ought to give effect and as a separate element  that no disorder of the mind shall poison his affections, pervert his sense of right, or prevent the exercise of his natural faculties—that no insane delusion shall influence his will in disposing of his property and bring about a disposal of it which, if the mind had been sound, would not have been made. In addition, the original wording, ,  and  are all approached as not requiring actual understanding, but instead being capable of understanding . As this is a common law test created by judges, it is capable of being modified by judges, as they see fit in the light of modern circumstances. Modern psychiatric knowledge has allowed the test to be developed by having a further element added and that is for the testator to be capable of exercising his decision-making powers. This test is focussed on the ability of the particular individual and his particular estate. The outcome is always unique to the particular facts. Where the circumstances and assets of a testator are simple or straightforward the level of capacity required will be lower than that for the testator with complex circumstances and assets. A court administered test The test in Banks v Goodfellow has proved to be long lasting as it was not a definition in medical terms, but a plain English definition of what a person should be capable of understanding in order to make a will. The test is still applied by a court. A medical opinion, while being potentially valuable evidence, is not determinative of capacity unless accepted as such by the court. The evidence of the will draftsman has considerable value to the court, if he has carried out his work to an acceptable standard. The test in a modern context The increasing longevity of individuals means that there is a greater chance of any person losing the capacity to make a will in their old age as a result of dementia. Indeed, dementia is the commonest reason for a will to be challenged, although any mental disorder may cause loss of capacity. This presents a major issue for the will draftsman who is not only required to have a knowledge of the legal test of capacity, but also of what its implications are, in order to record his relevant observations of the testator and form an opinion of his client's capacity. This, coupled with much greater prominence of negligence claims against will draftsmen, means that a careful understanding of what the draftsman should be doing becomes vital. ^ "Sound Mind and Memory - What Does this Phrase Mean?" from The Calhoun County, Michigan state government website Archived 2008-09-16 at the Wayback Machine. Retrieved September 17, 2008. ^ See also "sound mind and memory" at The Free Dictionary. Retrieved September 17, 2008. ^ See also "disposing mind and memory" at The Free Dictionary. Retrieved September 18, 2008. ^ Legal help mate website Archived 2011-07-13 at the Wayback Machine. Retrieved September 18, 2008. ^  2 All ER 595, 601, WLR 770. This page was last edited on 10 January 2019, at 11:58 (UTC).